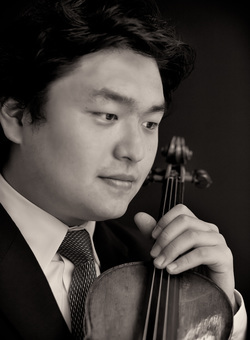 Mr. Ying Fu is currently the Associate Concertmaster of The Philadelphia Orchestra. In 2012, Mr. Fu won the First Prize in the 31st “Rodolfo Lipizer” International Violin Competition in Italy, as well as 4 Special Prizes. He is also holding the top prizes of 2011 Schmidbauer International Competition, 2009 Washington International Music Competition, 2008 “HAMS” Violin Competition in Chicago. With his great enthusiasm for chamber music, Mr. Fu has participated in many renowned summer music festivals, including Marlboro Music Festival, Schleswig-Holstein Music Festival in Germany and the Taos Chamber Music Festival, in which he has been working with many great musicians, including Pianist Richard Goode, Mitsuko Uchida, Cellist Peter Wiley, Violist Kim Kashkashian, Samuel Rhodes, Michael Tree, Borromeo String Quartet, St. Lawrance String Quartet, Brentano String Quartet and Pianist Robert McDonald. Distinguishing his talents and leadership, Mr. Fu has served as the Concertmaster of Schleswig-Holstein Symphony Orchestra in Germany, in which he has performed under Maestro Christoph Enchenbach and Valery Gergiev. He has also been a jury member of many young artist music competitions, including Greenfield Competition, and a faculty member of the Calvin String Summit in Michigan as well as the Philadelphia International Music Festival. Originally from Shanghai, China, Mr. Fu started to play violin at his age of 3. He went on to earn his Bachelor’s of Music from the Shanghai Conservatory of Music in China and earned his Master’s of Music in the Shepherd School of Music with Professor Sergiu Luca at Rice University in the United States. After two years of Doctoral program with Professor Cho-Liang Lin and Sergiu Luca in the Shepherd School of Music, he joined the renowned Cleveland Orchestra in the August of 2011.